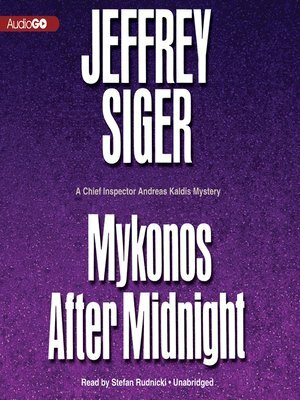 On the celebrated Greek island of Mykonos, a legendary nightclub owner is found in his home, bludgeoned to death. In his lifetime he had helped transform Mykonos from an obscure, impoverished Aegean island into a world-renowned summertime playground for the world's rich and powerful, which made the Mykonian people some of the wealthiest in Greece. All evidence points to obvious killers, but the murder has put into play some long-hidden, politically explosive secrets and drawn a dangerous foreign investor to the island paradise. Chief Inspector Andreas Kaldis, feared head of Greece's special crimes division, is certain there is a far more complex solution to the murder, and he vows to find it. His quest for answers, amid the entrenched cultural contradictions that give Mykonos so much of its magic, has him battling ruthless opportunists preying on his country's weakened financial condition. And he soon learns that there is an unexpected high price to pay for his curiosity as he becomes locked in a war with a powerful, clandestine international force willing to do whatever it takes to recast and control Mykonos—no matter what the cost, no matter who must die.